Iran arrested, imprisoned or killed at least 860 journalists in the three decades after the 1979 Islamic revolution, according to documents leaked to media watchdog, Reporters Without Borders (RSF). Whistleblowers passed on 1.7 million official records for the period from 1979-2009, detailing judicial proceedings against an array of citizens, including minorities, government opponents and journalists, RSF said at a news conference in Paris on Thursday. At least four of them were executed, it said. The leak coincided with Tehran marking the 40th anniversary of the Islamic Republic’s founding last week. Christophe Deloire, RSF’s secretary-general, said the group spent months cross-checking the records with its own documented cases and those of other NGOs, and established that hundreds of journalists had been targeted by the state. In its analysis, RSF said it identified at least four journalists who were killed, including Simon Farzami, a Swiss Iranian of Jewish origin who was the bureau chief of the French news agency, Agence France-Presse (AFP), when he was arrested in 1980. The other prominent journalist in the file is Farj Sarkhohi, editor of a political magazine who Tehran said disappeared en route to Germany in 1996. It also said Iranian Canadian photographer Zahra Kazemi died from beating injuries at Tehran’s Evin prison in 2003 after taking pictures of families waiting outside the facility. Iran has denied her killing with an official report on her death failing to disclose the cause of death. The files added to evidence of a massacre in 1988 in which about 4,000 political prisoners were executed allegedly on the orders of Ayatollah Ruhollah Khomeini, founder of the Islamic Republic. Iran has always denied any massacre took place. Other records in the leaked file include those of human rights advocates, notably Shirin Ebadi, a lawyer who was awarded the Nobel Peace Prize in 2003 and who now lives in exile after she and other women were forbidden from working as judges following the 1979 revolution. 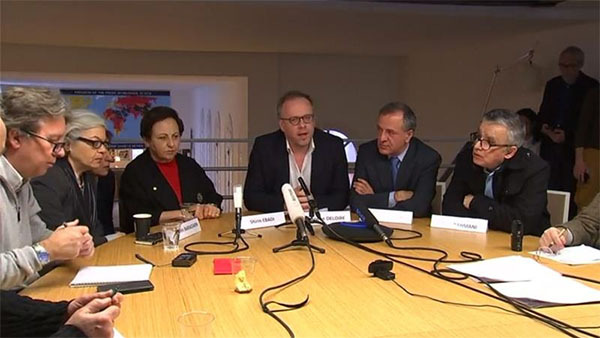 Ebadi was present at the news conference in Paris addressed by the RSF on Thursday. Deloire said his organisation would refer the file to the UN High Commissioner for Human Rights Michelle Bachelet in the hope that further steps could be taken to hold Iran to account. “The very existence of this file and its millions of entries show not only the scale of the Iranian regime’s mendacity … but the relentless machinations it used for 40 years to persecute men and women for their opinions or their reporting,” he said.